This full study first appeared in the September 2009 issue of Pediatrics, the scientific journal of the American Academy of Pediatrics. Car safety seats are one of the most effective ways to protect children from injury and death in the event of a car accident during the first years of life. For the best protection in a crash, car seats require infants to be placed in an upright position. However, this posture can partially compress the chest wall and reduce airway size, resulting in lower levels of oxygen. The study, “A Comparison of Respiratory Patterns in Healthy Term Infants Placed in Car Safety Seats and Beds,” compared oxygen levels in 200 newborns while stretched out on a safe sleeping surface, positioned in a car bed, or sitting in a car seat. The mean oxygen saturation level was significantly lower in the car seat (95.7 percent) and the car bed (96.3 percent) compared to lying on a safe sleeping surface (97.9 percent). Previous studies have found similar effects on premature infants. This study confirms that the respiration of full-term infants is also impaired by car seats and car beds. The study authors suggest these safety devices be used only for protection during travel, and not as replacement for safe sleeping practices or babywearing means. In other words: leave the car seat in the car. Wrap/sling/wear your baby when you go places. At home, lay baby down on a safe surface or wear your baby while s/he is napping (safe babywearing in upright positions does not impede oxygen flow, but has been shown to improve it). When lying your baby down, put him/her onto a safe sleeping surface, or snuggle up next to him for a snooze. Do not leave your baby to sleep in a car seat. Additional Baby Sleep information here. I love the fact that it's the dad that is wearing the baby. It's. Great demo of a newborn carry in the moby! Thanks for sharing! It makes me sad when I see babies carted around in their "buckets" like they are a piece of luggage. The little one is going to want out soon anyway, so why not just put them in a sling or front pack or other babywearing device right away? Maybe having some cold hard facts will finally convince people. What about cradle swings for colicky babies? I'd like to transition him out of his swing soon, but I can't find enough information on this, or what the consequences might be on how long to let him sleep in his swing. We tried co-sleeping, but he needed the constant motion of the swing for the first few months. Now I'd like to go back to co-sleeping. Does anyone know of any research on this, or the best way to try to get the baby to sleep on a solid surface? I love your post, and I am not surprised at all to hear this! I DO have a question though, if you do not mind. Catrina - that is a great question. It actually is not the upright position that is the problem - it is the body position - the curving and compression on the lungs and airway. 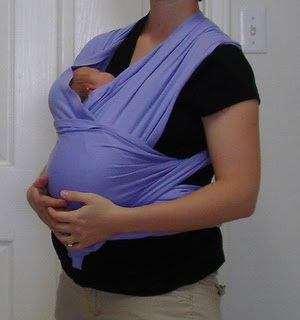 The same problems exist in poorly constructed slings/carriers that are not designed for proper/healthy babywearing use. (The Infantino - sold frequently at Targets and WalMarts around the nation is one example of a baby-carrier that is NOT baby-friendly or safe). The key is to be informed of proper and safe babywearing methods (there are many options -- but they all allow a baby's body to extended in a non-compressed manner). Another reason not mentioned: infant carseat carriers are not intended to safely attach to anything but the carseat base. You frequently see parents with their infant carriers on the top of shopping carts. Following a very stressful incident where my infant in her carseat fell off the cart (who only had a scratch on her fingers and toes thank goodness!) I am a STRONG advocate of not taking the infant seats in anywhere...cards, on tables, on chairs, anything. What killed me about our incident, too, is that I normally toss LO in the wrap. But it was 104 degree day, with no air in the car and both kids and I were super sweaty....and I was literally in the store 15 minutes. I figured it would be ok, right? Nope. A little sweat and the time to tie my wrap is well worth it to my LOs!!!! In order to teach this effectively (childbirth classes), can you tell me why this is a concern? What are the results of a lowered oxygenation level in an infant? lowered oxygenation level in an infant can cause severe brain damage and death. Amy - the brain cannot grow normally and body organs cannot function properly without adequate oxygen supply. This is especially problematic when we are addressing neurological and respiratory concerns. SIDS increases among bucket babies who do not receive adequate oxygen flow throughout their lungs and body organs and especially to the brain. What is the % danger point for doing damage? i love my wrap, sling, and mei tai and use them a lot. My daughter would scream and cry horribly whenever in the car seat when she was little, so i never even attempted to carry her in it. maybe this is why she hated being in there so much? when she got closer to a year, she would sometimes fall asleep in the car (and would wake completely up if transferred), so i'd bring her inside in her seat, and put her seat at a laid back angle and let her nap until she woke up. would this still be as bad for them? What about carbeds? I saw it mentioned with a slightly better O2level, however, do you think it's any *better*? I babywear as much as possible, however I have baby #4coming and will have a newborn and a 1 year old..I know that I won't babywear the newborn constantly, and running my oldest into school isn't totally worth taking him/her out of the carseat for the few minutes it will take. I do however have a carbed and thought that may be better than a conventional bucket seat...Anyone have thoughts?? Adriana was born at 35 weeks she had to have a car seat test done in the NICU for 2hrs before they would release her she passed but i still don't leave her in her seat any longer than i have to i feel bad if i have to carry her in the seat into the house cause i have to use the restroom badly. Otherwise i always wrap her in her moby shes safer happier and i can feel her breathe. Plus she hates her car seat screams almost all the time she has to be in it. mamaof4... what you say is interesting because it seems that babies who were forcibly strapped down after birth (either because they were being genitally cut - male or female circumcision - or because they 'had' to have a carseat test in the NICU) have this innate memory of sorts and HATE their carseats (or being strapped in) after that initial bad experience. Besides the extremely dangerous aspect of cutting off their oxygen supply, it is also a good time to remember not to use anything other than the carseat's inserts. No snuzzlers, no JJ Bundle Mes, no Neck positioners, no Travel pillows, etc. They can push the child's head forward, which will compound the oxygen problem and can cut off their airflow to the point of death. They are not tested or approved for use with your carseat, so it voids your carseat warranty and your insurance company might even refuse to pay out or injuries or to replace the carseat after an accident. They are often not fire-retardent, which means in an accident your baby could be strapped into a flaming seat. Many of them interfere with the straps or go behind the baby, which can cause ejection in an accident (and ejection typically means death). Many of them interfere with head velocity and protection, which again basically means death b/c the head and neck are most at risk in an accident, especially if forward facing. 1) Only use the inserts that came WITH your seat. 2) Alternatively, you can use tightly rolled up receiving blankets or prefolds around the child's head. There was a news report last year about a woman who came home from a party, slightly woozy, and before she passed out on the sofa (no doubt mindful of all the reports about how dangerous sofa-sleeping or sleeping with an intoxicated parent is to a baby) carefully set her baby-in-carseat next to her on the floor. When she woke up, the child was dead. I never was able to find any follow-ups on this, but the initial investigation was trying to find a way to blame the mom and the danger of extended carseat sleeping wasn't even on the radar. Did this test include the car seats that can be in multiple positions? I ask because my son has one where we can lock the handle to where it's like he's in a bouncer, but it's his car seat, granted he's not a newborn, but just curious. My other question is does this study follow older children? I know the study stated newborns, but what about other "car seat" children, does this apply to them as well? Interesting that in the video, the man is shown retrieving a newborn from under a loose blanket in a bassinet, or that is how it appears. That is very unsafe. Perhaps you can select an alternative video depicting the male sling user. As much as I advocate this, there are babies who genuinely hate being in slings believe it or not. My daughter didn't want to be in one for nearly three months. So what was I supposed to do when I _had_ to go the grocery store? Carrying a newborn properly plus picking up raw meat is a no-no in my book. I would make the carrier was locked on the cart. They can do that ya know. And when she did finally liked being in the sling,it was only for a short time. And yes, I was putting her in properly. She didn't like being confined all the time. We unfortunately had to use our car seat a lot in Daniel's first months as we had no other options. We didn't know about hammocks (which we eventually saved up for) and he couldn't co-sleep or lie flat due to reflux. He didn't seem too squished up in the seat at that point to be honest, and he actually seemed to fare better than any baby bouncer etc. we tried. I really wish we had known about other things, such as hammocks, as this article and articles on spinal curvature really worry me and make me feel like a bad mummy. But there are other reasons for parents using carseats out of the car, not just sterotyped parents who 'cart their children around like luggage'. As much as I would have like to wear my babies I had triplets. Severely premature. One of them came home on oxygen and due to that the only way to take her anywhere was either in her bucket seat or in a stroller. She was also on a pulse ox meter for 10 months. She always had the highest O2 ratings when in her seat or in a bouncy chair. Lying in a safe position- her O2 would drop strongly. The same was true in the NICU with all my kids. They all needed to be in an incline. I also have 3 kids who love their car seats (even now- at 22 months). They don't mind being strapped into their feeding table. I am glad about that. So happy to never have to fight them- because honestly, if they fought me on it, they wouldn't go out much. It is enough work raising 3 babies who are the same age.... now I have to feel guilt about doing things "not the best way". Instead, I did things the best for us. The way our pulmonalogist recommended. The way that kept my very ill daughter alive and so she is now thriving. Please, please remember that while what is generally best, is not always best. When I see articles like this that don't acknowledge that sometimes there are other ways, other reasons- I end up feeling concerned and angry. And guilty. What did parents do before the portable car seat? we held them in our laps, not the safest way, in the 60s we also had carbeds, no straps or anything. Ofcourse we didn't have carseats either. Very dangerous but we had nothing to compare it to back then. I won't drive across a parking lot without mine. Unknown - you can reposition your seat slightly so that it tips enough for your toddler to be leaning back so this doesn't happen. Some people use a foam wedge or a noodle or rolled towel or something that will allow the seat to be tipped back AND still be tightly strapped/secured into the seat so it is not moveable. We've done this for our babies (birth through 5 years) and it works well to avoid those head-tips that hurt their necks and breathing so badly.